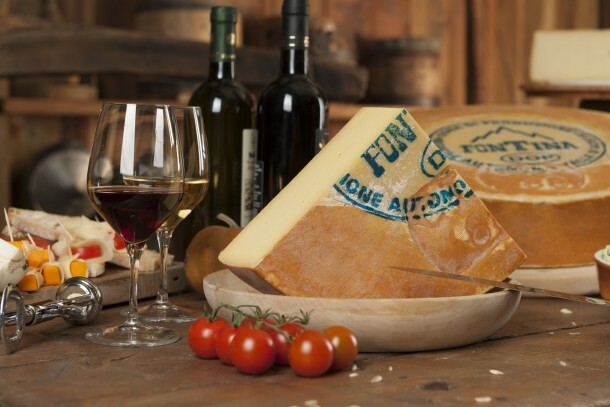 Fontina is an Italian cheese that literally melts in your mouth which has recently been named as one of the top 26 cheeses in the world by the Wall Street Journal! This cheese has probably been around since the late 1400s but it has been known with the nomenclature of Fontina of Valle D’Aosta since 1800s and. In 1957 the Consorzio Produttori e Tutela della D.O.P. 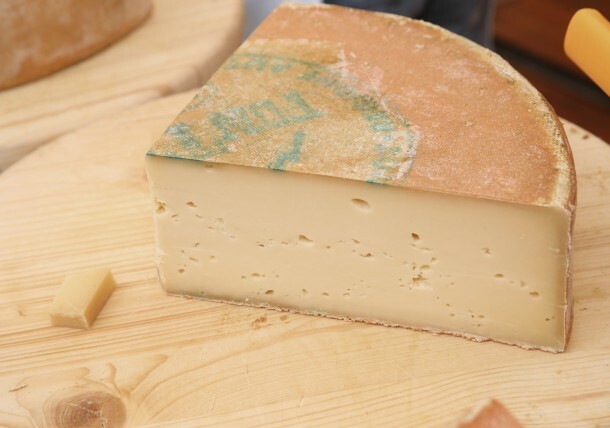 (Producer Consortium for the Safeguarding of Fontina’s PDO) was established and to this day it determines the production standards of this amazing cheese. 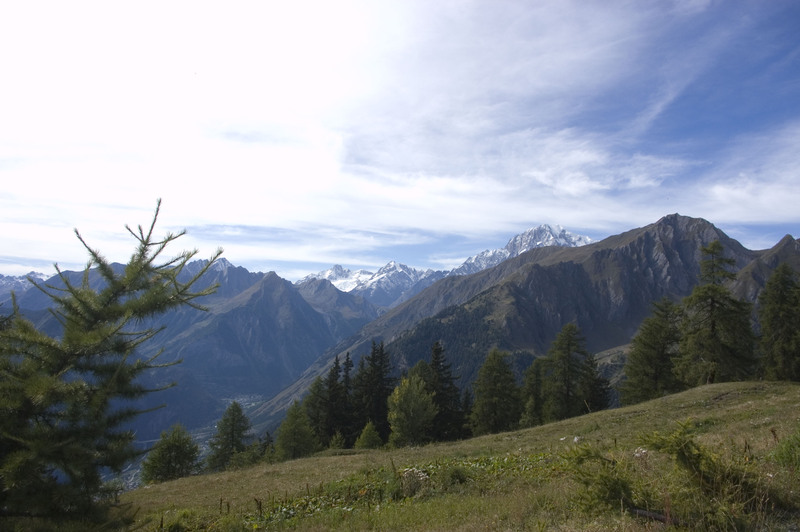 Fontina is produced in the Aosta Valley in the north of Italy, a region surrounded by the highest mountains in Europe including the Mont Blanc and the Matterhorn. Up in these alpine pastures the cows (all of which have a name, horns and a bell) graze rich, aromatic forage. The combination of flowers, herbs and water gives their milk a wide range of aromas. 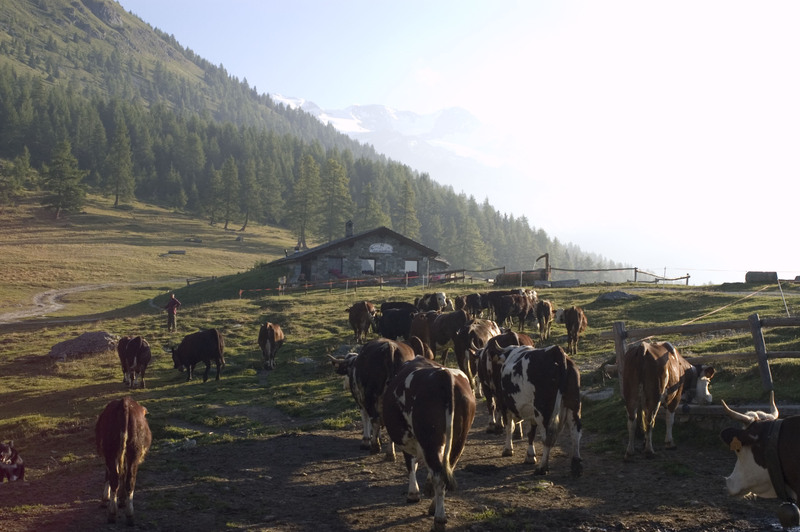 The cheese is made twice a day, just a few hours after milking and branded with both the cheesemaker’s unique number and the DOP mark, certifying it’s origin and quality and it is then left to mature for 80 days in natural caves of the Aosta Valley. The sweet, delicate flavour and milky aroma of Fontina, together with its smooth, supple and creamy texture, dotted with the characteristic “eyes”(small air bubbles that are sparsely found in the cheese’s body), make it a true treat for the palate. This is an ancient recipe for Fondue from the Val d’Aosta, it is not complicated but you do need good PDO (genuine) Fontina and it’s important to stick closely to the timings and preparation instructions! Step 1. Dice the 450g of Fontina at room temperature and a spoonful of wheat flour in a pan; add a glass of cold milk and stir well with a wooden spoon. Mix together and leave to rest. Step 2. Cook the mixture over low heat, stirring continuously with a wooden spoon; bring to heat but make sure the Fontina doesn’t boil. Step 3. When the Fontina has melted, remove the pan from the heat and add the 4 egg yolks: whisk the eggs in well. Step 4. Put the pan on the heat again and continue stirring until the temperature reaches 60/70° so that the eggs cook with the Fontina. 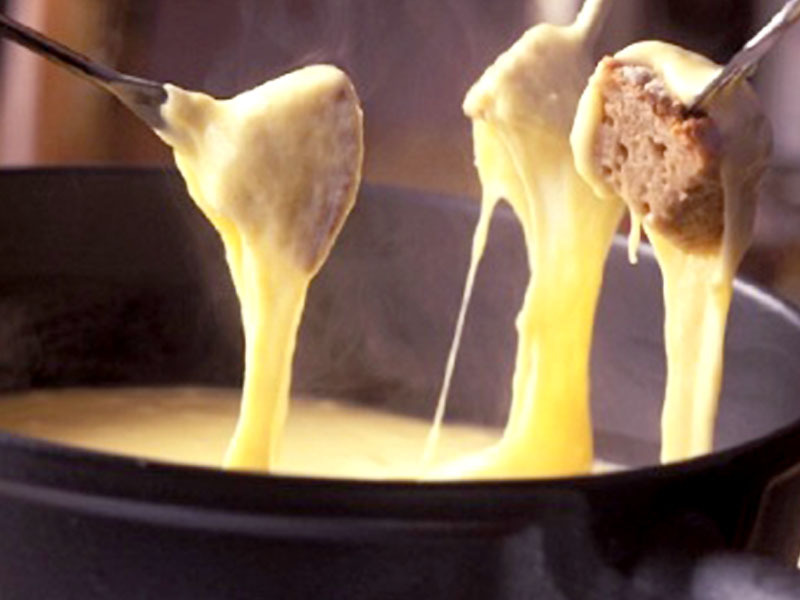 Serve as soon as the fondue is creamy adding some diced, chargrilled bread or croutons. These pancakes are simple to make and wonderfully tasty! Step 1. Beat the eggs, slowly add the flour and milk until you have a smooth, consistent creamy mixture. Step 2. Pour a ladleful of mixture into a wide non-stick pan and cook the pancake for a few minutes until golden. Make pancakes with the rest of the mixture. Step 3. Place the ham and Fontina on the pancakes. Roll them up and place in a buttered ovenproof dish. Step 4. 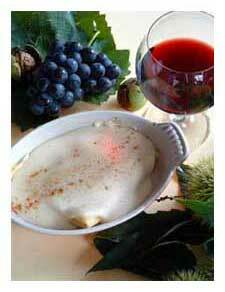 Cover with Béchamel sauce and some curls of butter. Step 5. Season with salt and pepper and make a gratin in the oven for 15 minutes at 180°.